The following example demonstrates reversal (facilitated healing) of heart disease in one of our patients. Figure 1.1: Patient is a 59-year-old woman. 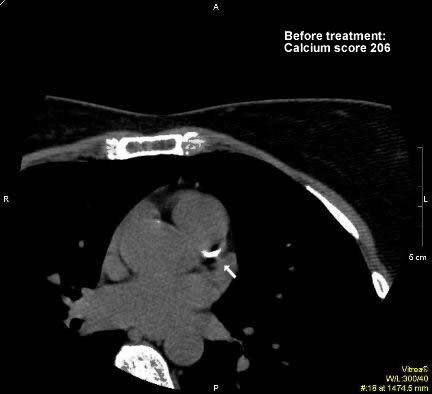 Initial coronary calcium score was 206 on Agatson scoring system. A large calcified plaque at the origin of coronary arteries (arrow) is present. 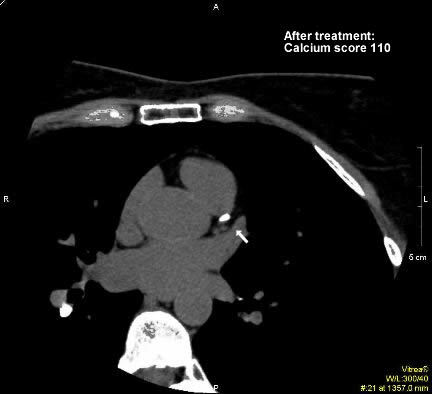 Figure 1.2: The same patient 7 ½ months later: Coronary artery calcium score of 206 was reduced to 110 (Agatson scoring system). This is a 46.6 percent improvement with use of inexpensive and easy to implement integrative medicine approach. Heart disease reversal program does not have to be burdensome, although we have to give-up the worst and most dangerous of our habits. At times, when disease is severe, it is prudent to be radical. Radical dietary change may make big difference. Even those with extremely high calcium scores (above 3800 on Agatson scoring system) will benefit. Please, be aware that heart disease reversal program, even as simple as ours, is not a do-it-yourself project and requires expertise and active involvement of an experienced integrative medicine specialist. There is no age limit for getting better. We have seniors in their 70s, 80s, and 90s who are active, totally independent, and who had the condition of their severely occluded and calcified carotid or coronary arteries improved, or healed (resolved). What is good for your heart is also good for bone strength and brain function. Dietary factors that lower homocysteine levels also contribute to reduction of the risk of heart disease, strokes, heart attacks, peripheral vascular disease, Alzheimer's disease, vascular dementias, bone fractures, and many other medical problems. Figure 2.1: The patient is a 69 year-old woman. Her initial coronary calcium score was 200 on the Agatson scale. Large areas of calcified plaque along coronary artery and some in aorta (arrows) are present. Note the marked thickening of the disease affected artery. 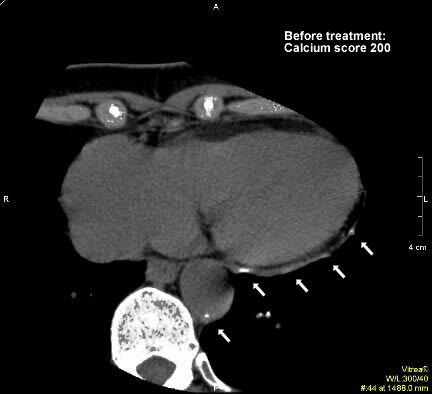 Figure 2.2: In one year coronary artery calcium score of 200 was reduced to 13 (Agatson scoring system). This is a 93.5 percent improvement. Most of the artery (to the right of arrow) is now healed and free of calcium. The arrow points to a small amount of plaque that has not yet resolved. Reversal of cardiovascular disease (facilitated healing) or arresting of disease progression is not only possible but easy, as our experience indicates. Many of our patients reversed heart disease, as evidenced by decalcification of coronary arteries. Many others decreased or completely eliminated plaque from their carotid arteries. Still others decreased the size or completely reversed aortic aneurysms or ectasias. All this by following our easy to implement nutritional protocol of whole foods and use of safe, relatively inexpensive, all-natural products and fiber. As there was no need for surgical treatment, there was no time loss from work, no long-term disability, no expensive treatments, and no risk of strokes. Surgical treatment with coronary artery bypass grafts may be of benefit for some patients who suffer from frequent angina (chest pains). However, surgical treatment does not arrest progression of coronary heart disease and re-occlusions are common. Green Medicine works and causes no harm to the environment! Fish will thank you! For all of the above reasons and for your survival, it is wise to be well informed! Dying of heart attack or stroke is a typical way how people end their journey. The causes of both of these "terminator" conditions are identical in the U.S. While heart disease is rare in Japan and other far-east countries and especially rare in Okinawa, stroke in Japan is fairly common. The strokes in far-east countries are hemorrhagic in nature, most likely due to too low cholesterol levels in their populations. As we well know, cholesterol is essential for maintaining integrity of the brain, blood vessel walls, and is an essential ingredient for production of steroid hormones. The solution? Increase the dangerously low cholesterol levels by increasing consumption of extra-virgin olive oil and increasing consumption of oily cold water fish or/and by taking high quality supplement of fish oil. Make sure that fish you eat is free of mercury and PCB contamination. Factors that are responsible for the myocardial infarction or heart attack, are almost identical to the causes that lead to "strokes" or brain attacks. It is good to know that what is bad for your heart and arteries, can also compromise your mental health and greatly increase your risk of Alzheimer's disease. Heart Disease: How We Get It? We pay to have it. Yes, this devastating "disease" is the consequence of bad choices. Whenever we choose to buy foods that are nutrient-poor, or consume foods that are depleted of nutrients by being exposed to high temperatures of cooking and frying or that are laced with man-made, partially hydrogenated, trans-fatty acids, the highly atherogenic fats, we ask for it. When we purchase a comfortable easy chair and a TV set, instead of a kayak, we ask for it. Commuting may hurt us too. When we spend two hours in a car driving to work and back instead of walking or swimming in the local pool, we miss the opportunity not to have it. How does heart and vascular disease develop? This part of the equation has been well researched and is now well understood. It is a presence of lethal synergy of several risk factors and nutrient deficiencies that may make some of us vulnerable to degradation of blood vessel walls. Fortunately, many risk factors are quite easily correctable, as our experience indicates. Dr. Radzik advises that you combine proper nutrition, active lifestyle, and other preventive measures with the appropriate medical care that only your physician can and will provide. Although prevention makes great difference, do not underestimate the benefits of early detection. Here, primary example is early detection of colon polyps and early stage of colon cancer. There are many other conditions that are easy to control with a proper nutritional and lifestyle modification program.